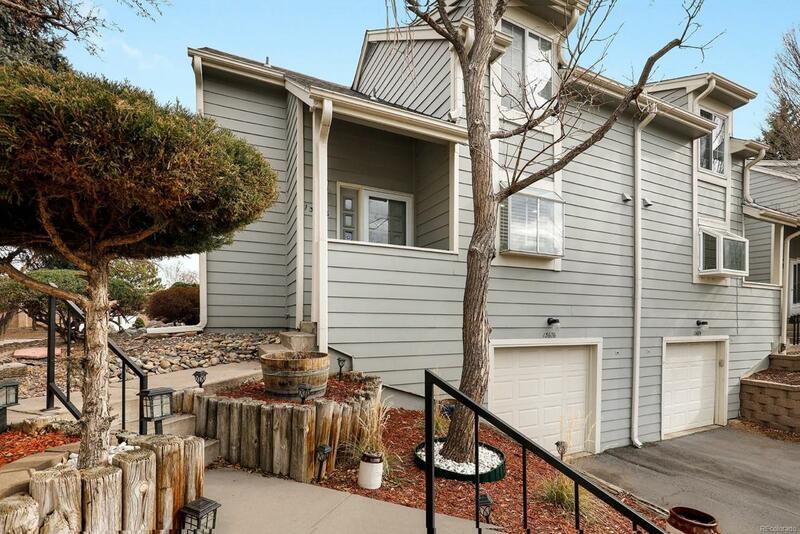 Spacious immaculate end unit townhouse in the Chimneyhill area of Heather Ridge. Upon entry, you are greeted by soaring vaulted ceilings in the foyer, an airy open floor plan & stylish wood accent wall. New modern grey paint ties the entire home together and provides a seamless and stylish look. Sizable eat-in kitchen features stainless steel appliances, breakfast bar, abundant cabinet space & garden window. Living room has dramatic vaulted ceilings, wood burning fireplace with a stone mantle focal point & sliding door access to the private patio. Full bath and a bedroom that would make an excellent office round out the main floor. Vast master suite encompasses the entirety of the upstairs and has 2 walk-in closets & en-suite 5 piece bathroom with double vanities. Another chic wood accent wall leads down to the basement that features a family room, additional full bath, bedroom perfect for guests as well as storage & laundry space. Great location close to light rail, school & parks.